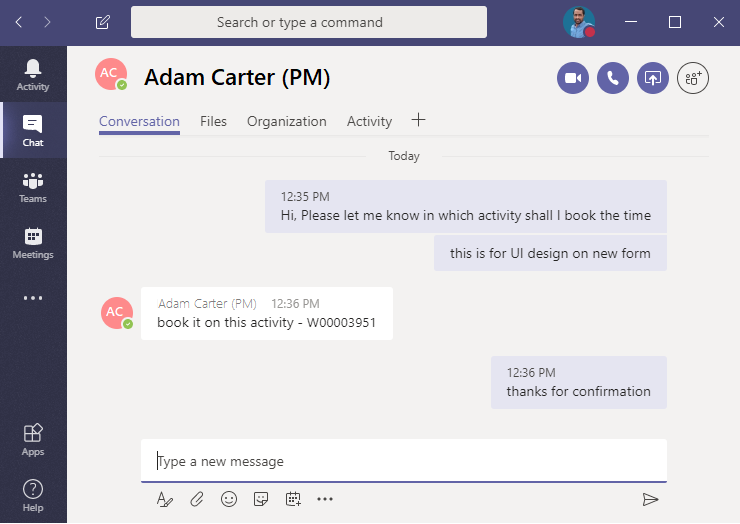 Communicating with the right person is seamless with embedded Microsoft Teams chat buttons. A user can initiate a Teams chat, with the right person, from buttons in the form they are already working in. One of the forms is shown below. When Project accountant prepares an Invoice proposal for projects and submits to the Billing approver for approval, In such scenarios to fasten the approval process project accountant can chat with the billing approver to look into the submitted invoice proposal and revert back for changes so that the project accountant can proceed with posting of the invoice. Resource can chat with the Project manager. The Project manager is assigned on the project as Project manager for the selected record. Resource can chat with the Time approver. The Time approver is assigned to the Resource on the Worker record. Project manager can chat with the timesheet Resource. The Project manager, Project accountant, or Time approver can chat with the Resource or Time approver. Project accountants can chat with the Billing approver. The Billing approver is assigned on the Project contract as Billing approver for the selected Invoice proposal.